Been working hard with my uni work as well this week. 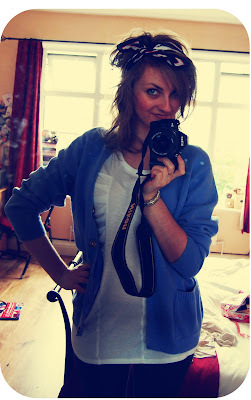 The vintage cardigan in my photo is one of my little projects for the brief. As you may know, its a brief on customisation and reworking existing garments to save money in the credit crunch. I’ve had this cardigan for ages and wanted to jazz it up a bit, so the other night I sewed on some new military style brass buttons. It looks so much better! If you’ve any stories or examples of customised clothes let me know. I’d be really grateful for the help, and I can document your thoughts in my sketch book! 3 sleeps to go! Feeling a bit better about going away now. My boyfriend, Dan, found a thread about the hotel’s high sickness rate, and it seems to of been a tummy bug that was going around our hotel and the one next door. It seems to of calmed down now, and all the bad reviews for sickness were written around the time of the bug. Fingers crossed its all ok now. Finally I can start to get excited! Tomorrow I will be at work for the last time before I go. Can’t wait for home time to come around!